Rare to find complete and unopened box of 120 mint unissued blue tunic buttons. 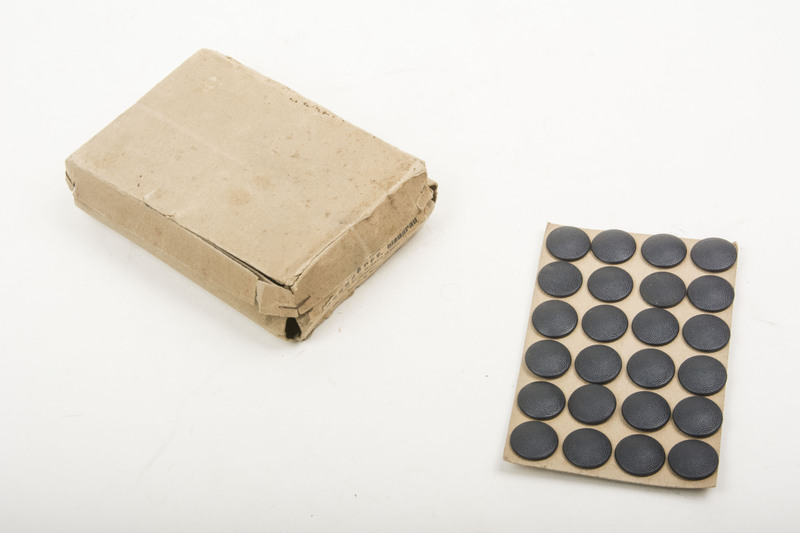 Original 1942 dated Blaugrau buttons for Heer, Luftwaffe and SS. In 1943 a new einheitsfarbe meaning colour for all branches was introduced and used on all garments. This was never fully implemented but a large portion of the M43 and most if not all M44 tunics received these. From that date onwards Graublau was the new textbook colour for pebbled buttons on uniforms. 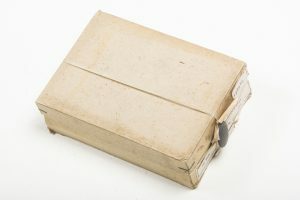 These can be seen on original m42, m43 and m44 tunics, mantels and caps. Also the M43 tropical uniforms and Fliegerblusen featured these! The price is for one card of 24 perfect mint buttons. Hard to find early buttons for the M42 field cap. The price is for a set of two unissued buttons including worldwide shipping! 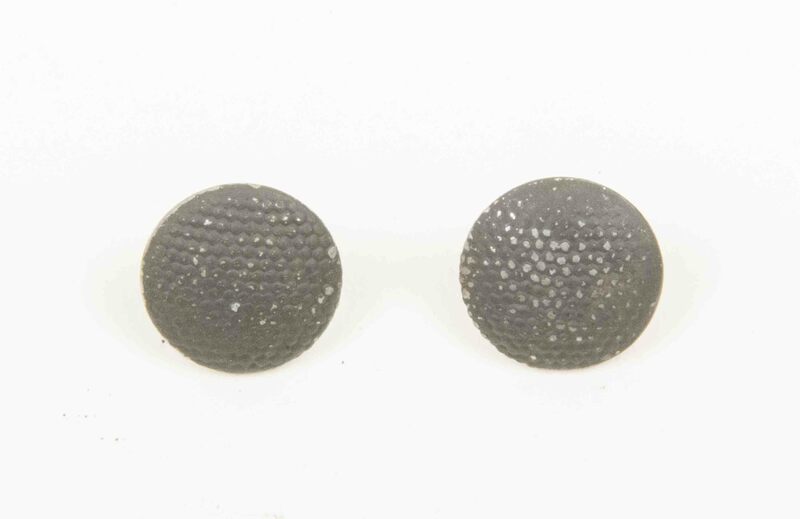 A great set of two original buttons for a Heer or Luftwaffe M43 field cap or Einheitsfeldmütze. Nicely marked RSS on the back. Rare buttons to find and all in good usable condition! Free shipping! 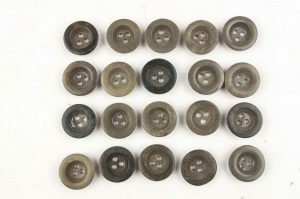 A great set of original buttons for a Heer or Luftwaffe M43 field cap or Einheitsfeldmütze. Nicely marked AH 42 on the back. Rare buttons to find and all in good usable condition! Free shipping! A unopened pack with 10 rolls of unused rolls of thread. This type of thread was used during the war in the construction of various uniforms and for the application of cloth black SS insignia. Also the black thread can sometimes be seen on Tarnjacken. The price is for the whole pack. I have two packs in stock. Enough thread to restore insignia for life! 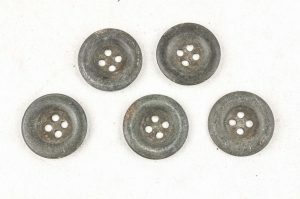 A nice set of matching tunic buttons dated 1940 and a set of scarce glass buttons used on Waffen-SS tunics and other garments. The set comes complete with a set of tunic belt support strap hooks and a spool of period issue thread. A complete set of tunic hardware that is hard to come by. I only have one set of these. A nice set of original late war buttons for a complete Heer/Waffen-SS M44 tunic. If you want to put original buttons on a M44 tunic, this is the type you should get. 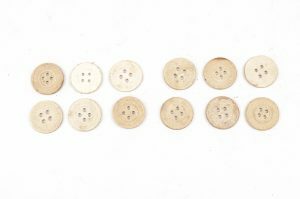 These buttons are all in unissued condition and ready to be sewn onto a tunic! 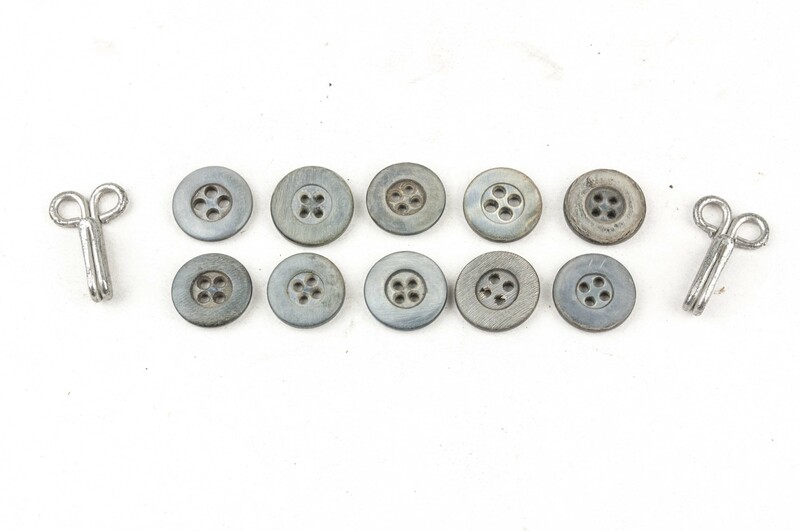 The set consists of 10 late war “S-ring” buttons only seen on M44 tunics in blue colour. This blue colour is the textbook kind for the Heer and SS M44 button. Next to that it includes 8 pressed paper buttons as used on the cuffs and internal pockets of the tunic. 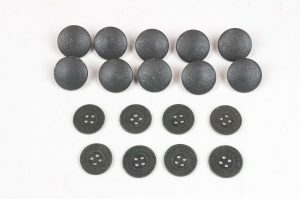 A set of 10 small horn buttons including two internal suspender hooks which where standard for every M36 and M40 tunic. You get 10 buttons and two hooks, exactly the amount needed for a M36 or M40 tunic. Rare buttons to find and all in good usable condition! Free envelope shipping! 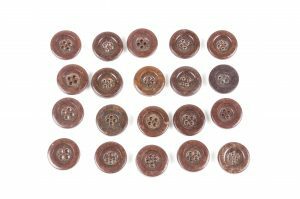 A great set of 20 original buttons for early trousers, tunics and other garments. 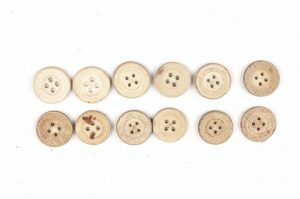 Rare buttons to find and all in good usable condition! Free envelope shipping! 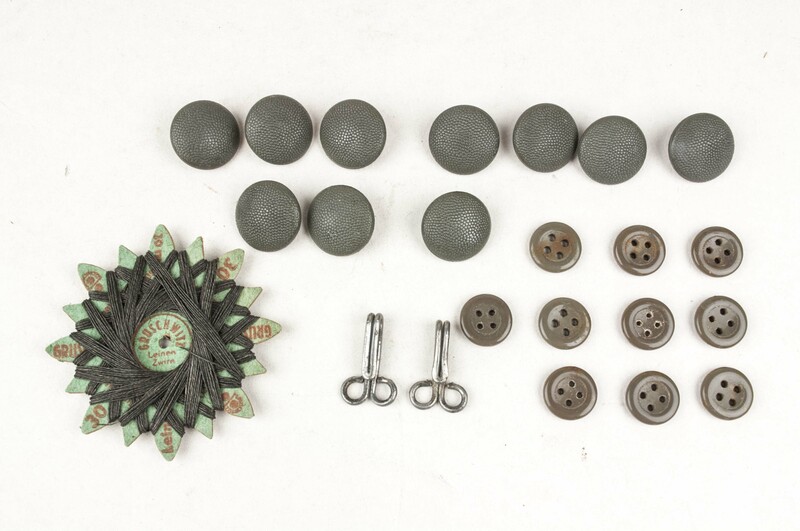 A great set of original buttons for a Heer or Luftwaffe M43 field cap or Einheitsfeldmütze. Rare buttons to find and all in good usable condition! Free shipping! 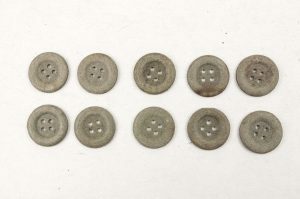 A great set of original buttons, enough for one Italian ww2 tunic . Rare buttons to find and all in good usable condition! Free shipping! 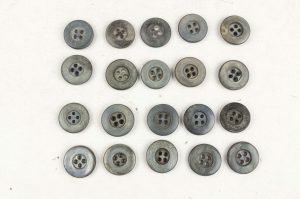 A great set of original buttons, enough for a set of M40 trousers or Langhosen. 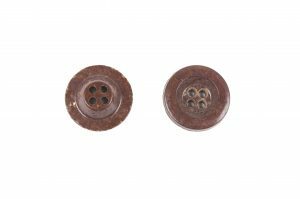 Rare buttons to find and all in good usable condition complete with the original adjustment buckle! Free shipping! 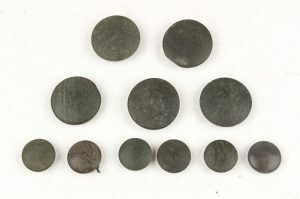 A great set of original buttons, enough for a set of M43 trousers or Keilhosen. Rare buttons to find and all in good usable condition! Free shipping! 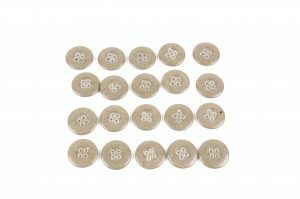 12 nice gray pressed paper buttons as used on shirts, tunics, camouflage smocks, reversible parkas and many other garments. Rare buttons to find and all in good usable condition! Free shipping! 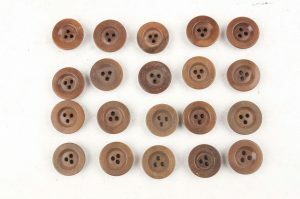 10 nice pressed paper buttons as used on shirts, tunics, camouflage smocks, reversible parkas and many other garments. Rare buttons to find and all in good usable condition! Free shipping! 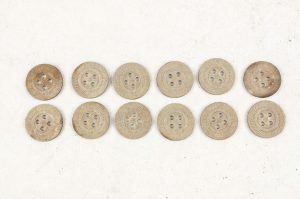 12 nice pressed paper buttons as used on shirts, tunics, camouflage smocks, reversible parkas and many other garments. Rare buttons to find and all in good usable condition! Free shipping! 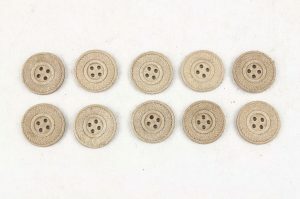 10 nice gray pressed paper buttons as used on shirts, tunics, camouflage smocks, reversible parkas and many other garments. Rare buttons to find and all in good usable condition! Free shipping! 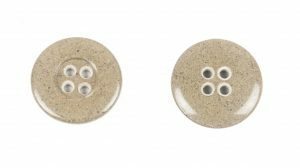 5 nice glass buttons as used on FJ smocks, Fliegerblusen, coveralls, reversible parkas and many other garments. Rare buttons to find and all in good usable condition! 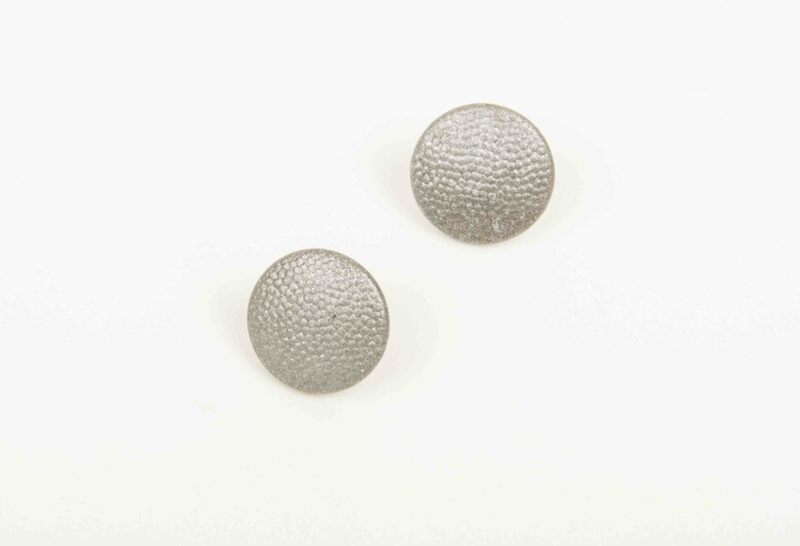 5 nice zinc buttons as used on FJ smocks, Fliegerblusen, coveralls, reversible parkas and many other garments. Rare buttons to find and all in good usable condition! Free shipping! 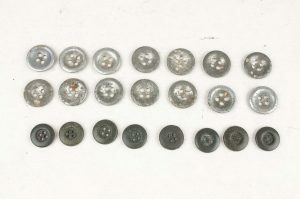 20 gray Italian buttons as factory applied on late war German Zeltbahns, Italian camouflage coveralls, Erbsentarn Keilhosen and many other garments! 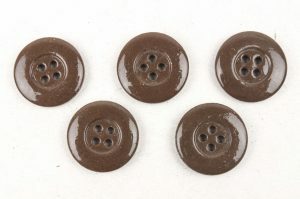 These bakelite buttons are all in great condition and have a nice deep gray colour. I have a few sets available. Strong and usable wehrmacht issue boot laces from 1943. These are 100cm long and made of a synthetic ersatz material in stead of the regular leather or cotton laces of that time. 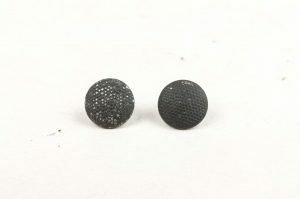 The ends are tied dow by metal tips to stop fraying. Allthough these are period laces they are very strong. This is a original bundle of 4 pairs, a great original spare to have when you run into a nice pair of shoes without laces. 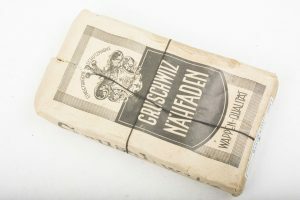 These are original Wehrmacht issue laces, I included a picture of the original label of the box these came out of. Worldwide shipping is included in this price!